Living healthy starts by weighing just right for your height and build. 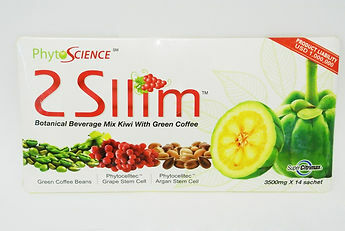 Introducing 2Sllim™, specially formulated with stem cells (Argan & Grapes) and phytonutrients (Garcinia Cambogia & Green Coffee) to help you achieve effective weight loss and getting rid of excess weight, getting you the curve you always wanted! Excess fat is useless in your body. Garcinia Cambogia & Green Coffee are fat combating agents designed to suppress cravings and promote fat metabolism. Giving you the energy to stay active and burn even more fat to reduce body mass index. Diabetes is the number one cause for obesity and affects your metabolism. Green Coffee naturally balances sugar level in your body using enzymes to regulate glucose. Keeping your sugar level just right for you. Sleeping better improves your mood and keeps you fresh. Garcinia Cambogia is known for its potency in increasing serotonin for improved mood and better sleep. Sleeping well keeps your body healthy and energetic throughout the day. Good health and overall well-being starts by weighing just right for your height and build. Having the ideal weight is something everybody wants, but unfortunately do not have. One of the biggest challenges people face in life is losing weight. In a world where thin is the golden standard, many people torture themselves by going on fad diets and going through different weight loss plans just to achieve their ideal weight or figure. With 2 Sllim, weight loss, losing unwanted pounds and achieving the curve have never been easier, faster, and more effective. 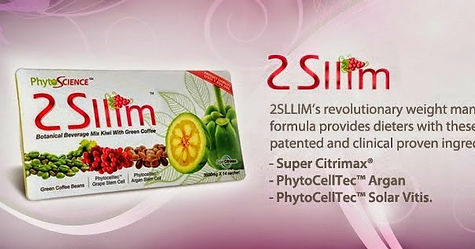 2 Sllim is a proprietary blend of patented and clinical proven all-natural ingredients -. Super Citrimax® Garcinia Cambogia, Green Coffee Bean extract, Phyto- CellTec™ Argan Stemcells and PhtyoCellTec™ Solar Vitis, an effective and wellprepared weight management formula for realistic and attainable results. A natural, non-stimulant, safe and effective fruit extract from the South Asian fruit Garcinia cambogia, that helps support healthy body weight. Super Citrimax® is rich in (0)hydroxycitric acid (HCA), a natural compound that supports dieting without affective the nervous system. Super Citrimax blocks the conversion of carbohydrates into fat by inhibiting an enzyme called ATP-Citrate Lyase. It promotes storing excess energy from unused carbohydrates as glycogen rather than fat. This then signals the brain to turn off all hunger signals. As a result, it suppresses appetite as well. Not only does Super Citrimax increase fat oxidation (“fat burning”) and suppress the appetite, but it may also help lower bad cholesterol levels while pushing up the good cholesterol. In addition, it increases serotonin levels in the brain, a neurotransmitter that helps improve moods, as well as decrease hunger and improve sleep. PhytoCellTec™ Solar Vitis is based on stem cells from the Gamay Teinturier Fréaux grape – a grape from Burgundy, which is characterized by an extremely high content of polyphenols for UV protection. PhytoCellTec™ Solar Vitis reliably protect epidermal stem cells from UV stress and thus from skin aging caused by light. PhytoCellTec™ Solar Vitis increases the vitality and efficiency of all essential skin cells and improves the skin’s resistance.